A plant growing in a neighbor's front yard. Today's photo is another lesson in observation. over the winter when I went for a walk and into the spring, whenever I passed a neighbor's house, they had little garden box near their front porch and there looked to be pine-cones sitting in them. I figured that they just happen to coalesce there together and no one bothered to clear them out. However, while cooling down on my run home today, I happened to notice them today and realized that they are definitely not pine cones. I don't know what kind of plant they are, but they are pretty cool with their varying shades of red, orange, and green. 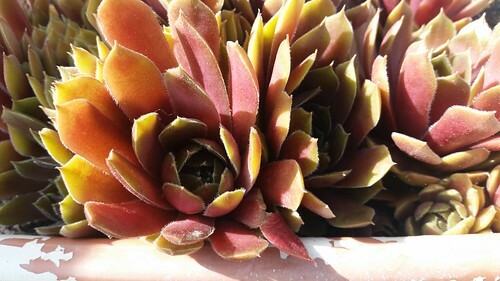 The little hairs on them make me wonder if they are related to the species that aloe plants belong to or even cacti. But it goes to show that sometimes even if you look at something, you don't quite see it.